The first stage of the war, from the time of the Partition Plan till Operation Nachshon (11.29.1947 – 4.3.1948), was characterized by events which were initiated by the enemy. There were Arab riots all over the country; they created the riots and initiated the battles. In those days, the bitterest battle was over control of the roads – the road to Jerusalem, to Gush Etzion, to the Galilee and to the Negev. The Arab villages, which were situated close to the roads, constantly attacked travelers and supplies. Food and weapons did not reach the places where they were badly needed. 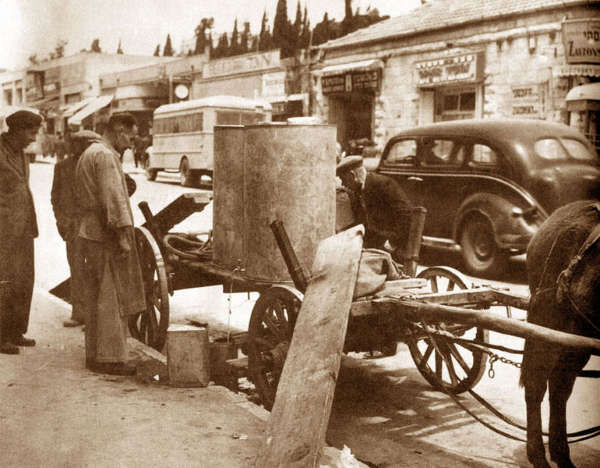 Some of the convoys which were sent to help the besieged never reached their destination: the Nabi Daniel convoy, the Yehiam convoy, the Halamed Hei (35) convoy, the Hulda convoy and the Hadassah convoy. In March, 1948, the situation was bleak. Many settlements in the North and in the south were isolated, Gush Etzion was besieged, the Old City was besieged and cut off. The convoy system was not working. The Yishuv called the month, “Black March”. A change was needed. In the second stage of the war, from Operation Nachshon till the declaration of the State of Israel (4.3.1948 – 5.15.1948), it was decided that the initiative would shift to Jewish hands. Plan D was put into motion. This consisted of operations whose goal was to capture mixed cities and thus break the strength of the Israeli Arabs. In the framework of Plan D, the following operations were carried out: Nachshon, Harel, Avraham, Yevusi, Hametz, Yiftach, Barak,Ben Ami, Matateh, Maccabi A and B and the conquest of Tiberias, Haifa, Safad, Acre and Jaffa. In addition, within the framework of Plan D, the road to Jerusalem was opened! Several dreadful events happened during this period: the tragedy of the Hadassah convoy, and the battles of Mishmar Haemek and Ramat Yohanan. The third stage was from the declaration of the State of Israel and the invasion of Arab armies till the first ceasefire in the fighting (5.15.1948 – 6.11.1948). 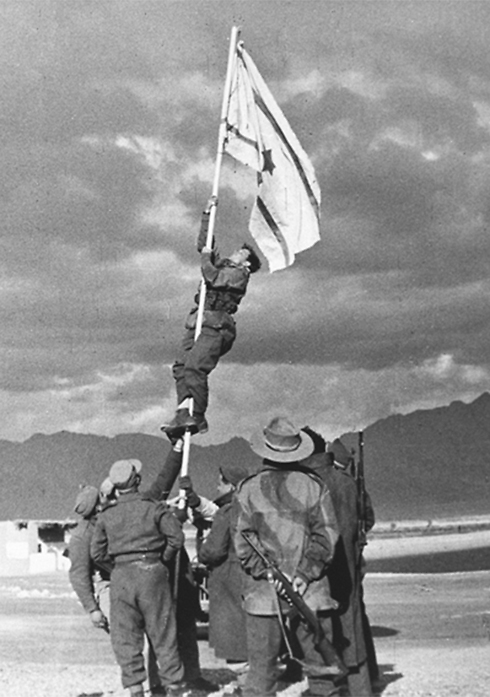 The day after Israel declared its independence, on Saturday, May 15, 1948, five Arab armies, Syria, Lebanon, Iraq, Jordan and Egypt, invaded the State of Israel. Israel found itself in the position of the few against the many. Israel had seven airplanes, while the enemy had 45, Israel had 13 tanks, while the enemy had 45, and Israel had 15 armored vehicles, while the Arab armies had 237. Thus, the young state found itself with few soldiers and little equipment opposing the forces of organized armies on three fronts: the northern, central and southern fronts. The northern front: Three armies invaded in the north: Syria, Lebanon and Iraq. Fierce battles were conducted at the two Degania kibbutzes, Degania A and Degania B, near the Sea of Galilee. The Syrians stormed the Degania kibbutzes, with the support of planes and artillery. The force was led by tanks and armored vehicles, followed by the infantry. The defenders of Degania fought courageously and succeeded in repulsing the attack. 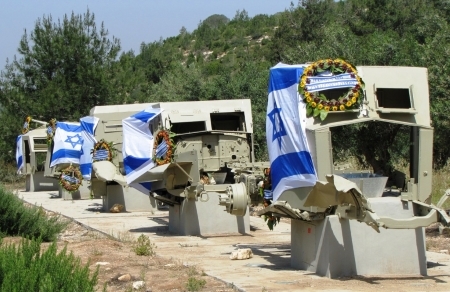 The Degania battle was the first time that the IDF used heavy weapons that came from abroad. The Syrians conquered the settlement of Mishmar Hayarden, which was their only achievement. The Syrian attack was stopped. The southern front: The Egyptians attacked from the south. Their central line of attack was along the coast and their aim was to capture Tel Aviv. The Egyptian army tried to capture the settlements on the way, but it met with strong opposition, so it skirted the settlements. Kibbutz Yad Mordecai blocked its path to Tel Aviv. The Egyptian army launched a major attack. The defenders suffered heavy losses and after five days of fierce fighting, the kibbutz was evacuated. The five days in which the kibbutz stood up to the Egyptians were extremely important because it gave enough time for a shipment of air force planes to arrive in Israel and to be assembled. The Jordanian army scored quite a few victories. It managed to capture several settlements around Jerusalem, further tightening the siege. Gush Etzion, Atarot, Neve Ya’akov, Bit Ha’arava. Ramat Rachel, and neighborhoods in Jerusalem were cut off and subject to attacks. The 100,000 residents of Jerusalem were under siege. They lacked food, medicine and water. IDF forces attempted to break through and bring supplies to the city. The residents defending the city were exhausted. Throughout the month long invasion, the city was blasted by artillery and mortars, whose aim was to break the spirit of the city’s civilian population, which had already been weakened by the hardships of the siege, and to cause the city to surrender. More than 10,000 rockets and bombs were fired on the city, wounding and killing hundreds, yet the civilian population bravely endured the bombings. 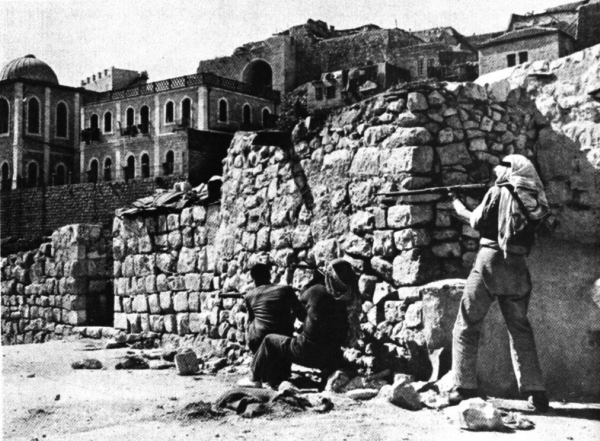 The attempt to enter the New City failed and most of the efforts of the Arab Legion were focused on the Old City. 1700 Jewish people lived in the Old City, few of whom were fighters. Constant mortar and artillery fire forced the defenders to abandon their positions. The Jewish Quarter was shrinking in size and the situation was steadily worsening. On May 28, it was decided to negotiate surrender. The healthy men were taken prisoner, the elderly and the children were sent to the New City. 293 residents of the Jewish Quarter were taken prisoner by the Jordanians. The first ceasefire (6.11.48 – 7.9.48) followed political activity at the U.N. Security Council concerning the problem in Israel. Bernadotte, the negotiator, demanded a two-way ceasefire. The IDF took advantage of the ceasefire to reorganize, to regain strength, to absorb new fighters, to conduct maneuvers and to arm itself with new weapons. During the ceasefire, the Burma Road was paved. On July 9, the Egyptians attacked and the battles lasted for ten days. In these battles, the IDF was united,with larger fighting forces, capable of initiating and attacking and with an air force…After another ceasefire, the critical stage was reached. Bitter battles were waged on all the fronts, which brought about an Israeli victory. In the South, Operation Yoav was conducted. This broke through the road to the Negev. In the North, Operation Hiram was waged, which led to Israel’s control of the Galilee. On the Egyptian front, the IDF conducted Operation Horev, which led to Israeli control of the Negev and the conquering of Eilat. The Arabs were interested in a ceasefire since they were suffering multiple losses on the battlefield and they feared the expansion of Israel. The Jews were interested in a ceasefire mostly because they needed to be able to absorb the masses of immigrants that were pouring into Israel. In addition, they also hoped that it would be a permanent ceasefire and that the U.N. would recognize the status of the State of Israel. Thus, on 7.20.49, the two sides agreed to a ceasefire. A supervisory body was set up in which U.N. observers were to supervise the ceasefire. In these agreements, a “green line” was demarcated which was Israel’s official border with Jordan until the Six Day War. Watch this fascinating movie about Gush Etzion and Halamed Hei Convoy. Because of the Arab attacks on Gush Etzion, the Haganah sent infantry reinforcements. Thirty-eight fighters under the command of Danny Mas set out by foot at night from the Moshava Har Tuv to Gush Etzion, passing many hostile villages. One of the fighters sprained his ankle and returned with two other fighters. The other 35 continued. Near Kfar Tsurif, 5 kilometers from Gush Etzion, they came upon a group of women gathering wood. The women notified the villagers (another version tells that they met an elderly shepherd). A heroic battle followed and the fighters were killed. After all the ammunition at Gush Etzion had been used and the convoy failed to arrive and hadn’t made contact, the search for them began. What the searchers found was horrifying. The bodies had been dismembered, beyond recognition. The men were buried together. This was one of th emost shocking events of the war. This large convoy which consisted of 50 trucks with supplies for the civilian population and the military and 12 armored vehicles seet out from Jerusalem to Gush Etzion. On the way back, it encountered Arab barriers near Nebi Daniel. Mobs of Arabs opened heavy fire on the convoy. The battle lasted for 30 hours. In the end, 20 were killed and 50 were wounded. A long time passed until the British came and helped get the Jews out. All of their weapons and vehicles fell into Arab hands. This was an attempt to break through the road to Jerusalem. The convoy consisted of 30 cars which contained supplies for the civilian population and military supplies and seven armored vehicles. It set out from Hulda in the direction of Jerusalem and was attacked by Arabs. The convoy got stuck in mud. The battle lasted for six hours. Seventeen were killed and twenty wounded. This was an attempt to establish contact with isolated settlements in the Western Galilee. 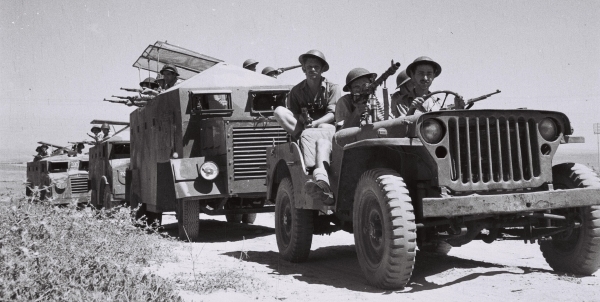 The convoy set out from Nahariya to Kibbutz Yehiam which was besieged. The convoy ran into an ambush near the Arab village, Kabri. The battle lasted for ten hours. Forty-six members of the convoy were killed and tens were wounded. This convoy set out from Jerusalem in the direction of Mount Scopus (Hebrew University and Hadassah Hospital). There were about 100 people in the convoy – doctors, nurses, lecturers and researchers. The convoy was transporting medical supplies and civilian supplies. It passed through Arab neighborhoods and was attacked near Sheikh Jarrah by rioting Arab mobs that opened heavy fire on them. The battle lasted for seven hours. British fire did not help to extract the convoy. Seventy-seven doctors, nurses and scientists were killed. That convoy suffered the greatest number of losses. During the War of Independence, hundreds of thousands of Arabs ran away from Israel or were chased out. (The Israeli estimate is 500,000 while the Arab estimate is 900,000). The refugees moved to Judea and Samaria, the Gaza Strip and to neighboring Arab countries (Egypt, Jordan, Syria and Lebanon). Most of the refugees had to live in refugee camps, which exist until today. 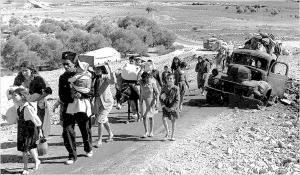 Because of their loss in the war and the accompanying refugee problem, the Arabs call the was “The Nakba”, the Disaster or the Holocaust. Following the Armistice Agreement of 7.20.49, a demarcation line was drawn separating Israeli forces from those of its neighbors. The line was drawn based on the deployment of forces at the end of the war. Because the line was drawn in green ink it is called the “green line”. This line actually became the border of Israel until the Six Day War, 19 years later.